Burkina Faso’s army has said it will install a transitional government, days after it seized power as President Blaise Compaore resigned. The move came after soldiers had fired shots at the state TV station and barricaded the capital’s main square as thousands of protesters demanded the military give up power. At least one demonstrator was killed in Sunday’s clashes. The UN has also condemned the military takeover and threatened sanctions. Long-time leader Blaise Compaore quit on Thursday, following days of anti-government protests. The army named Lieutenant Colonel Isaac Zida as the leader of a transitional government on Saturday. 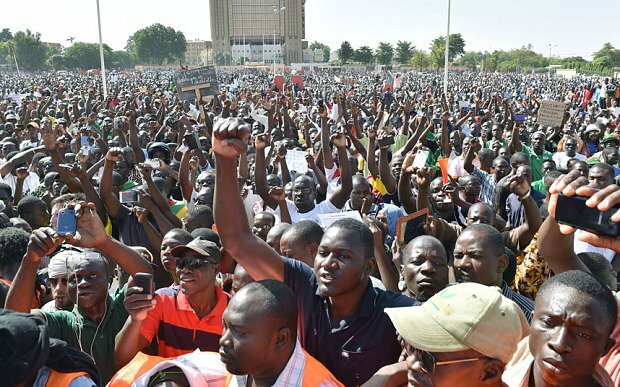 However, thousands of protesters gathered on November 2 in the capital Ouagadougou, demonstrating against the army. On Sunday evening, following a meeting with key opposition figures, a military spokesman said the army would put in place “a transition body… with all the components to be adopted by a broad consensus”. “Power does not interest us, only the greater interest of the nation,” the military said in a statement. It had been necessary to disperse protesters to “restore order”, the statement said, adding that one demonstrator outside the state TV station had died. There were chaotic scenes at the state broadcaster’s headquarters on November 2, as both opposition leader Saran Sereme and former Defense Minister Kwame Lougue turned up to a rally. It is believed that both had gone there, separately, to announce that they could head the transition government. However, shortly after they arrived, gunfire broke out and staff and protesters fled. National television resumed broadcasting a few hours later. Troops also cleared protesters from the capital’s main square, Place de la Nation. On Sunday evening, key opposition figures met Col. Isaac Zida for talks. Those present included Zephirin Diabre, leader of the Union for Progress and Change, former Foreign Minister Ablasse Ouedraogo, ex-PM Roch Marc Christian Kabore and Benewende Sankara, leader of the Union for Rebirth – Sankarist Party. However, Saran Sereme reportedly left before the talks began and there were no details on what was discussed. Mass protests first erupted last week when long-time leader Blaise Compaore attempted to extend his 27-year rule. Parts of the parliament building were set on fire, and the president fled to Ivory Coast. Under Burkina Faso’s constitution, the president of the Senate should take over after the national president resigns and an election should take place between 60 and 90 days afterwards. The African Union, the US and regional economic bloc Ecowas have all condemned the military takeover. The UN’s West Africa envoy Mohamed Ibn Chambas said the military must allow a civilian transfer of power, and sanctions were a possibility if this did not happen.